The man, named locally as Richard Osborn-Brooks, discovered two intruders in South Park Crescent, Hither Green, south-east London, at about 00:45 BST. The 38-year-old was taken to hospital but was pronounced dead at 03:40. 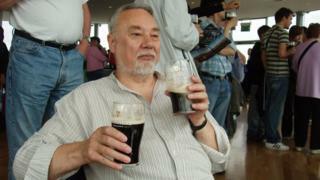 Mr Osborn-Brooks, who suffered bruising to his arms, has been arrested on suspicion of murder. He remains in custody at a south London police station. The other intruder remains at large. What are your rights if someone breaks into your home? The CPS and police urge people to always call the police first - if you are able. But according to official guidance, anyone can use reasonable force to protect themselves. The law doesn't require you to wait to be attacked before using defensive force, but does not protect you if, for example, your action is over-the-top or calculated revenge. Police said they were called to the property over reports of a burglary when they found the man collapsed in nearby Further Green Road with a stab wound to the upper body. One man who lives on the street said there had been a recent spate of burglaries in the area and his home had been broken into in recent months. "I was renovating the house and they broke in and took a laptop. I know this has happened to others recently," he said. Adam Lake, another local resident, said he "wasn't surprised" to hear about the burglary. "We've even had to put up CCTV at home because we didn't feel safe," he said. "I feel terrible for the man that was burgled. He doesn't deserve to be punished for defending himself," he said. For now, the streets are cordoned off as police in blue boiler suits search gardens and bins for anything that will help their investigation. Neighbours say there have been quite a few burglaries in this area recently - this is a relatively well-off part of south east-London with streets of semi-detached houses. The chair of the residents' association told me it is trying to make the area safer, working with police and the council to close off alleyways. At the same time it has been trying to bring the community together with street parties and other events. The dead man's next of kin have been informed and a post-mortem examination would take place "in due course", the Met said. Local ward Councillor Mark Ingleby described the killing as a "tragedy" and said it had come "out of the blue". He said there had been a "definite improvement" on tackling burglaries in the area thanks to an active Neighbourhood Watch scheme. New security gates had also been installed to prevent trespassers accessing alleyways behind houses, he said.